Varun Dhawan, Banita Sandhu and director Shoojit Sircar launched the trailer of the upcoming film October at an event in Mumbai on March 12, 2018. The trailer launch event also saw the presence of writer Juhi Chaturvedi and producer Ronnie Lahiri. 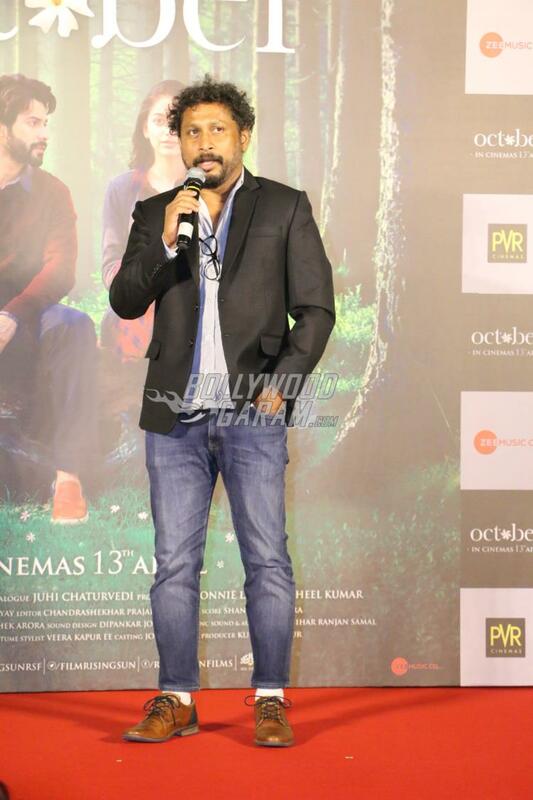 Shoojit during the launch event was all praises for Varun and said, “You will find the real Varun in ‘October”. To this Varun answered, “Every morning on the sets, Shoojit sir would make sure my hair is undone.” The actor during the event also revealed that he was the last one to be cast in the film. Varun during the launch event added that he was jealous when Aayushmann Khurrana bagged the Vicky Donor role and since then he wanted to work with Shoojit. The makers say that the film October is not a love story but a story about love. The Shoojit Sircar helmed film is due to be released in theatres on April 13, 2018.